We’re taking a look into the rear-view mirror, reminiscing on several of the most memorable matches of the two North American hard court giants. Some of them will stick with us for the tennis, others for the drama and still others because they were landmark events. It was the return that was on everyone’s lips, the moment that defined the game after the Australian Open: Serena Williams decided to end her BNP Paribas Open boycott. Fate had it that she would open her Indian Wells campaign against none other than enigmatic Romanian Monica Niculescu. The World No. 70 is open about her very particular game, which certainly played a big part in what would always be a memorable night. It was an emotional moment when Williams stepped out on court – for her, for everyone in the stadium and everyone watching. But she soon found herself in a scrappy opening round encounter with the reigning Queen of Slice. Williams struggled throughout the match – with her timing and range, with Niculescu’s spins, slices and dices, and perhaps the gravity of occasion. But after two hours, the top seed eased over the finish line. The Romanian had chances to wrap up both sets but when push came to shove, the American could count on her serve to get her out of trouble. The tennis wasn’t always stellar and, at times, Williams looked tighter than in any of her recent Grand Slam finals – but who could blame her? She has won 19 majors and plays those big matches with regularity. On Friday the 13th, 2015, Williams did something far more difficult – she plunged into waters that had once betrayed her. As she admitted herself, that alone made her feel like a winner. And rightfully so. I still struggle to understand or even process this match. It was just so, so weird. Lesia Tsurenko and Eugenie Bouchard came into this match under massively different circumstances. The Ukrainian qualifier had already won five matches just to make the fourth round, where the Canadian ingenue cruised through her two opening rounds in the Californian desert. Nonetheless, Bouchard entered Indian Wells with a few question marks. Has her arm injury healed? How are things with new coach, Sam Sumyk? Can she bring more consistency to non-Slam events? While the first two matches made it look like Bouchard’s ship was well on track, this encounter provided a fascinating insight into the World No. 7’s state of mind. Tsurenko took the match to her much higher-ranked opponent from the start, but within grasp of taking a one-set lead, she tripped and twisted her ankle. Bouchard had not been playing terribly to that point – but she wasn’t do much to unsettle her opponent, who continued playing with the controlled aggression that already gave her wins over Andrea Petkovic and Alizé Cornet in previous rounds. Just when it seemed that Bouchard had taken control of the match, new colors emerged. The Wimbledon runner-up suffered an abdominal strain, clearly affecting her serve and causing her to struggle against a limping opponent. Tsurenko’s pugnacity through injury earned her a final set, which won from a 1-4 deficit. Or did Bouchard lose from 4-1 up? During the changeovers, the Canadian was fairly emotional at times, as if at a loss with to how to handle the situation and the 74 unforced errors she went on to hit. It seemed to foreshadow a second straight loss in Miami, but will be memorable all its own for its almost hypnotic level of confusion. Few were optimistic about defending champion Flavia Pennetta, who returned to the Californian Desert all but poised for a big drop in the rankings. But the Italian veteran finally found some of the form that carried her to the title in 2014, upsetting Maria Sharapova in the fourth round and narrowly missing out on a second straight semifinal appearance. In a topsy-turvy match, she lost to the enigmatic Sabine Lisicki, who had had a similarly difficult season. The German had won just one match before arriving south of Coachella Valley, but nonetheless came in like a lion by the middle of March. Lisicki showed a much greater commitment to constructing points there – and later in Miami – with more patience and even more margin. There was still the occasional forehand into the net, but overall it looked like the 2013 Wimbledon finalist was playing with a more intellectual aggression. Lisicki’s tank ran empty in the next round playing Jelena Jankovic but it was a strong month for the 25 year old. For Pennetta it was a case of so close, yet so far. The former No. 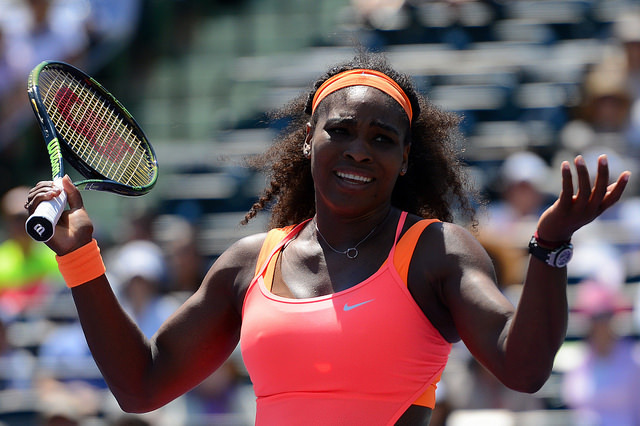 10 held multiple match points in the third set – but her opponent’s serve clicked when it mattered most. She might not have gone all the way again but it was good to see her playing decent tennis after a string of disappointing results. I’m not going to beat about the bush on this one. I’m not going tell you how it was good to see Sloane Stephens play two very solid tournaments in a row. I’m not going to tell you how fun to watch it is to watch Bencic soak up the pace and redirect shots down the line, particularly with her beautiful backhand. I’m not going to tell you how I’ll never cease to be amazed by the raw speed Stephens possesses. I’m not going to tell you that, after a difficult start to 2015, the Swiss is starting to look more like the player that shot up the rankings in 2014. Well, I kind of did – but still, I am going to tell you to watch the highlights of this match because it was a genuinely good two set match between 2 players who went toe to toe for the majority of the encounter. I’m looking forward to your next match, ladies. After Serena Williams found herself forced to pull out of their Indian Wells semifinal with a knee injury, all eyes were on Miami. The two traded blowouts in Singapore, and the third meeting between the top seed and Halep 2.0 took place in South Florida. It was looked on as a de facto final at the BNP Paribas Open, and similar opinions were held in Crandon Park – and it is difficult to defuse either after witnessing Williams capture her eighth Miami title in dominating fashion, dismantling Carla Suarez Navarro in under an hour. All the same, Simona Halep made Serena Williams work. Hard. Through much of the first set, it was a nigh on A+ performance from the World No. 1. The American’s serve was firing and her forehand helped emphatically end rallies against one of the best baseliners on the WTA. Perhaps most strikingly: everything looked so easy. There wasn’t much Halep from first ball, and so she did the only thing she could: put her tenacity into the balance, try to weather the onslaught and look for a lull in the Serena storm. And a lull she got. At the end of the second set, the American gave Halep a little opening and the 2014 French Open finalist reaped the rewards of staying tough with her opponent, forcing a decider. The 19-time major champion pulled clear of the Romanian early in the third, but still kept the door open for Halep to even the score from a 2-5 deficit. 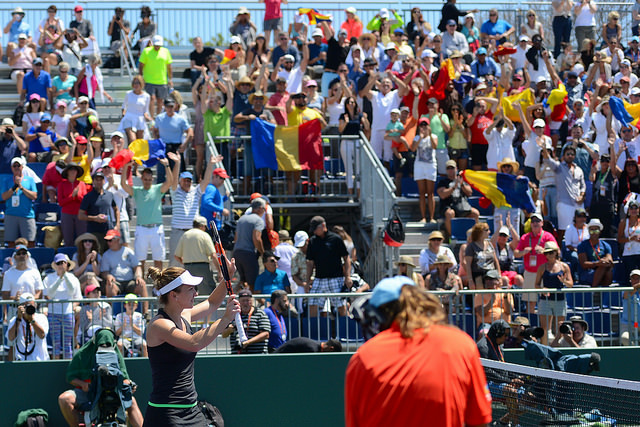 Williams was forced to raise her level one last time to clinch the encounter in front of a raucous pro-Romanian crowd. There have been those saying this was the best match of the year – even the past 18 months (hey Marion). I might not co-sign, but was this a worthy Miami Open semifinals? Absolutely! Would any Grand Slam be happy with this as their final? Totally! Was it entertaining, memorable and contain a mix of great tennis and drama? Easily! So that’s pretty good, then, right? Which were your favorite matches of the mini-majors? Sound off in the comments! I loved the 1st set of Pennetta vs Halep. It was a fierce battle.